I spoke to the former Director of Recreation for the Municipality of the County of Cape Breton about the flag. He remembers that Ralph MacLean coordinated the design of the Chain of Office for the Warden of the County but not the flag. The flag was created by a Committee of Council for the County's Centennial in 1979. The flag is simply based on the Canadian Flag with the two end panels changed to dark blue and the Seal of the Municipality of the County of Cape Breton substituted for the central maple leaf. 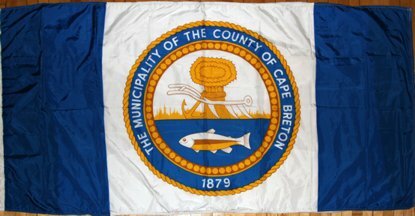 Apparently the Seal of the Municipality of the County of Cape Breton has existed in practically the same form since 1879. There was a centennial booklet produced in 1979 that probably has more information.